Pressure balanced expansion joints are designed to absorb movements from a pipe system. They can accommodate axial and lateral movements where due to structural or economic considerations the anchoring of the pipe system is difficult or impractical. Pressure balanced expansion joints do not transfer the internal pressure thrust onto to the fix points, adjacent equipment, or structures. In many cases only guides are needed to convert thermal expansion into a controlled movement, with fix points rarely required. For this reason, pressure balanced expansion joints can deliver signiﬁcant advantages. Particularly in such instances where pipe systems are connected to turbines, pumps, valves or other equipment, which are unable to withstand pressure thrust loads. Although pressure balanced expansion joints eliminate pressure thrust, it’s important to note that the existing load on the surrounding equipment is the total sum of the spring rates of both the flow bellows and balancing bellows. The movement absorbed by a pressure balanced expansion joint should be understood as follows: if the thermal movement in the connected pipe is 20 mm, the flow bellows of the pressure balanced unit will contract by 20 mm and the balancing bellows, with twice the effective area of the flow bellows, will expand by 20 mm. The advantage of a pressure balanced expansion joint lies with its capability to reduce the complexity and size of ﬁx points by eliminating the pressure thrust, thereby delivering stability to the pipe system. This also reduces the required space for structures that carry ﬁx points and guides. Pipe engineers are often challenged by space limitations due to the surrounding environment. Under such conditions it may not be possible to incorporate a number of ﬁx points and guides that are normally required at high pressures. The pressure balanced expansion joint is the optimum solution for additional scenarios such as a short pipe run connecting two vessels, which are unable to withstand the pressure thrust loads. It can also provide a good solution for pipe systems at elevated heights, where additional supporting structures would significantly increase costs. 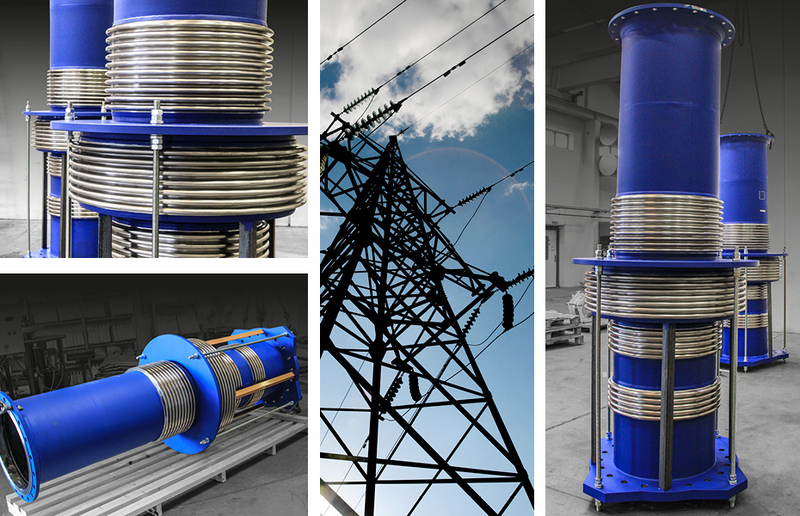 Pressure balanced expansion joints can be designed for any speciﬁc requirement with tie rods, cover and also for the absorption of lateral and/or angular movements (universal type).